Moses Gill was born on January 18, 1734 in Charlestown, Massachusetts, the oldest neighborhood in Boston. Gill became a merchant in Boston where he lived with his wife Sarah Prince, the daughter of Thomas Prince, pastor of Boston's Old South Church, from whom they inherited a large tract of land in what is now Princeton, Massachusetts. In 1771 Sarah died, and Gill remarried to Rebecca Boylston whose family was well known in Boston. Gill continued to spend a great amount of time in Princeton where he was a member of the Congregational Church of Princeton. Gill had retired from his business in 1767, and began his political career seven years later with his election to the provincial assembly. Shortly after his election, Britain abrogated the assembly as punishment for the Boston Tea Party; however, the members continued to meet as the Massachusetts Provincial Congress. Gill, already a member of the Sons of Liberty, continued to be involved when the Revolutionary War broke out in early 1775. During the Siege of Boston, Gill served as the head of the provincial congress' supply committee. Gill also had the honor of escorting George Washington from Springfield to the army camps outside of Boston. In 1780 when Massachusetts adopted its constitution, Gill was elected to the state senate and began serving on the Governor's Council. Gill was also chosen to serve on the Worcester County district court. After a failed run for election to the United States House of Representatives in 1789, Gill continued serving in Massachusetts. In 1794 he was elected lieutenant governor; a post to which he was reelected annually. Gill served first under Samuel Adams and then under Increase Sumner who died early in his term. Gill became acting governor and completed Sumner's term in office. Although Gill was considered as a candidate for election the following year, he was not popular. Before hearing that he had not received the office, Gill died while still in office on May 20, 1800. Throughout his life, Gill was a philanthropist, donating to his church and community including the donation of land which became the town center of Princeton. Gill, Massachusetts was named in honor of Moses Gill and all his contributions to the state of Massachusetts. 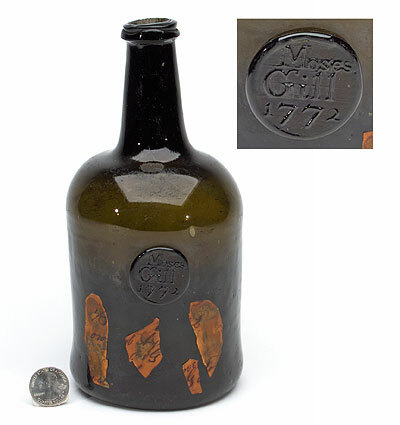 This bottle was offered in our Premier Auction 133, March 7-16, 2016.